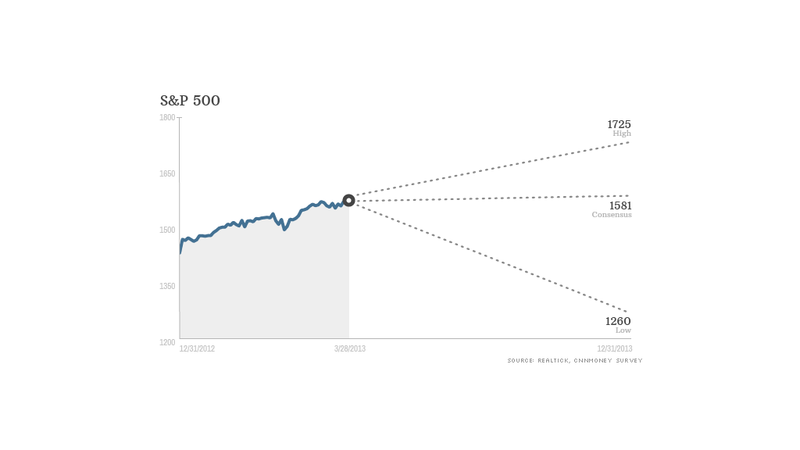 The S&P 500 should deliver a healthy 11% return for the year and end just above 1,580, according to a CNNMoney money survey. But that's less than 1% from current levels. The good news: experts think stocks will remain in record territory. The bad news: they don't think stocks will end the year much higher from where they are now. According to nearly 30 investment strategists and money managers surveyed by CNNMoney, the S&P 500 should deliver a healthy 11% return for the year and end just above 1,580. While that's a far more optimistic target than what experts predicted when 2013 started, it's less than 1% above last week's record closing high. The Dow Jones industrial average is forecast to end the year just below 14,900 -- a 13% increase for the year but only up 2% from its current level. One reason experts don't anticipate a huge rally from here: stocks had a stellar start to the year. The Dow surged 11% to a record high during the first three months, its best first quarter since 1998. The S&P 500 climbed 10%. "Those kinds of returns are really good, even on an annual basis," said Oliver Pursche, president of Gary Goldberg Financial Services. "I don't think the market will duplicate its first-quarter performance during the remaining quarters of the year." While Pursche expects that the S&P 500 will rise above 1,600 over the next several months, he thinks the broad index will then pull back and end the year around 1,575, as investors continue to deal with headwinds out of Europe -- particularly debt problems in Spain, Portugal and Italy. 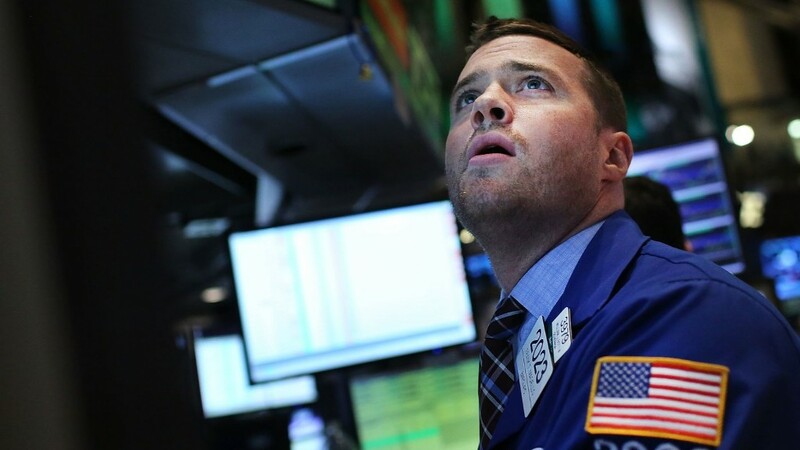 Alan Gayle, senior investment strategist at RidgeWorth Investments, warns that stocks are currently "a bit extended." He said he is waiting for prices to cool before he buys more. But his long-term outlook is far more bullish. Gayle's year-end target for the S&P 500 stands at 1,650, up another 5% from its current level. "I believe there is still further upside to the market, given reasonable valuations and continued positive economic momentum, particularly in the United States," said Gayle, adding that he expects further improvements in the housing market and consumers' balance sheets to support investor confidence. While most experts said stocks were either fairly valued or undervalued, a handful believe U.S. stocks are overvalued, and are forecasting a significant move down. Among those in that camp are Derek Hoyt, portfolio manager at KDV Wealth Management, whose S&P 500 year-end target is 1,350. That's down 14% from its current level, and would result in a 5% decline for the year. "Investors have become complacent," said Hoyt. "Expectations for solid earnings and economic growth in the face of current valuations and all the risks that are out there seem too optimistic." Hoyt noted that the so-called cyclically-adjusted price-to-earnings ratio, which values stocks based on 10 years of earnings growth adjusted for inflation, is well above its average. And while most experts point to slow but gradual improvement in the job market as a sign that the economic recovery is gaining strength, Hoyt said he's not convinced that hiring is strong enough yet to fuel robust economic growth. "I'm not saying the market will crash, but I do think it's overvalued based on the data we're currently seeing," he said.